When the Moo Pa soccer team of 12 Thai boys and their coach got trapped in a cave, then were miraculously rescued last summer, the world was gripped—but for Jimi Cendana and his wife, Kathleen, the emotional story of endurance inspired them on a personal level, too. They were about to venture into restaurant ownership with the opening of a Thai restaurant. And last month, Moo Pa, meaning Wild Boar, debuted on the corner of Anaheim Street and Mira Mar Avenue. The sign over the door has yet to change from previous occupant May’s Thai Kitchen and the layout remains the same, but the cozy space is now decorated with playful chalk drawings on its blackboard-painted walls. In addition to an illustrated collection of popular menu items such as pad Thai and green curry, dotting the walls are several cartoon boar faces—some goofy, some menacing. 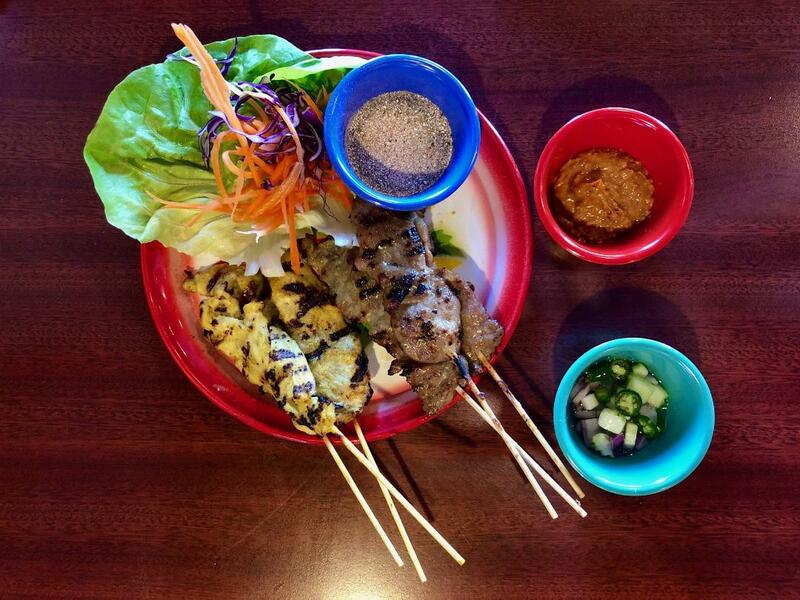 A chalkboard sign on the sidewalk announces $3 Thai beer specials. Cendana ensures patrons receive great service, flitting from table to table, taking orders and making conversation, while his son sits at the high-top counter next to the kitchen and colors. Originally from Thailand, Cendana and his wife moved to the United States 15 years ago. 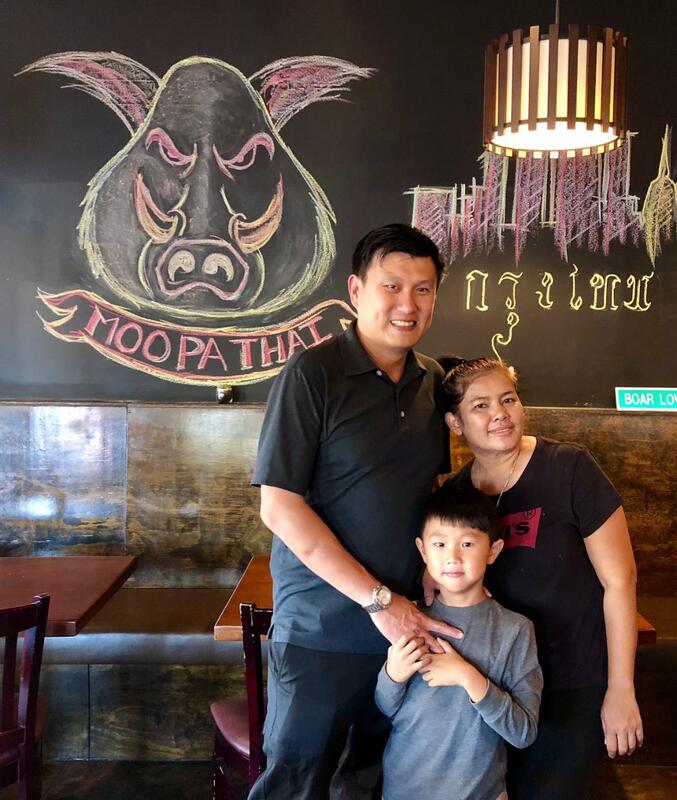 For Moo Pa, they teamed up with chef Tui Tuy, who moved here from Thailand just four years ago; together, they’ve created a sweeping menu of classic Thai street food, yakitori, grilled meats, salads, soups and curries. There’s also a separate menu of vegetarian and vegan appetizers and mains. Among the salads—which include spicy squid or shrimp, ground pork, and glass-noodle options—one standout is the som tum with salted black crab. 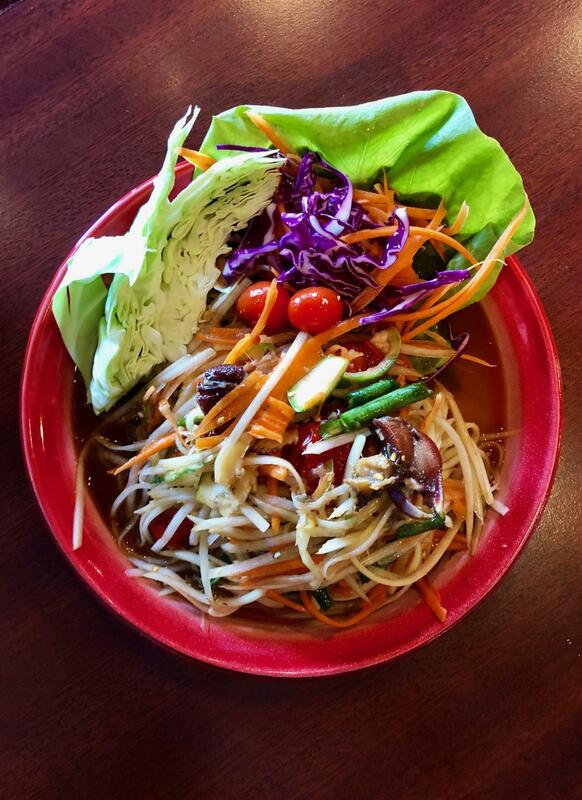 A “very authentic salad,” as Cendana explains, the som tum starts with green papaya shredded into narrow strips, then tossed with spicy chiles, green beans and chunky pieces of tomatoes in a pungent fish-sauce dressing. Throughout the mix are dainty pieces of black-crab claws and legs, still encased in their hard shells, adding a subtle taste of ocean water to a bright mix of fruit and veg. You’ll find none of the Americanized syrupy sauces that drowned noodles or chicken in the late 1990s and early 2000s. At Moo Pa, spice is the focus, coming in the form of a multitude of chiles, often married with onion and bell pepper. The dishes are clean and straightforward: Noodles, curries and entrées come with a choice of protein; the repeated chorus of “chicken, beef, pork or tofu (shrimp and crispy pork extra)” topped the majority of Moo Pa’s menu sections. Though there are many mild options offered for spice-wary customers, Moo Pa’s star dishes are the ones that’ll light you up. Tuy makes her spicy Thai basil eggplant with both fresh and dried chiles, plus garlic, onions, bell pepper and choice of protein; I ordered mine with fried cubes of tofu in a feeble attempt to calm some of the heat. 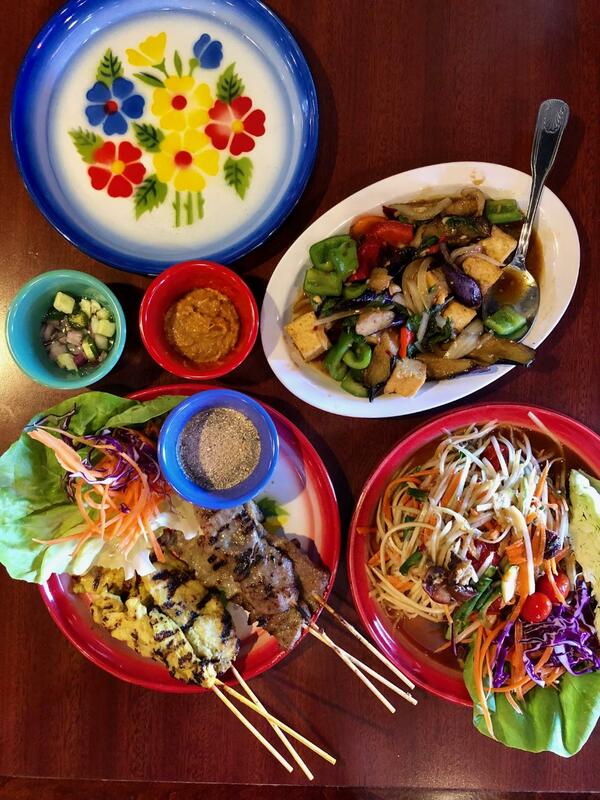 There’s hot, and then there’s Thai-hot. The black-crab salad was hot, but this was something else: sharp, clear and addictive. Even the chicken skewers, colored a rich yellow thanks to a marinade of cumin and other spices, and filet mignon skewers, which came with Thai dipping sauce and dusted with ground uncooked sticky rice, were accompanied by an unassuming cucumber salad that hid tiny bombs of seed-laden chiles. Those unfamiliar with the seriousness of heat in this cuisine should order a glass of Moo Pa’s iced tea—equal parts dark burnt-orange Thai tea and thick, sweetened cream—for mouth-cooling purposes. Moo Pa, 3832 E. Anaheim St., Long Beach, (562) 494-3003; moo-pa.business.site.